"Of course you know about the seven stages of love, but have you ever lived them?" Atharva Rathod and Meher Qasim. Are they in control of their own destiny, or its their destiny which is making them dance to its tunes? Only time would answer, as Atharva and Meher unwillingly and unknowingly transcend the seven stages of love. A quintessential tale of love and romance marked beautifully by its own rustic old school charm. 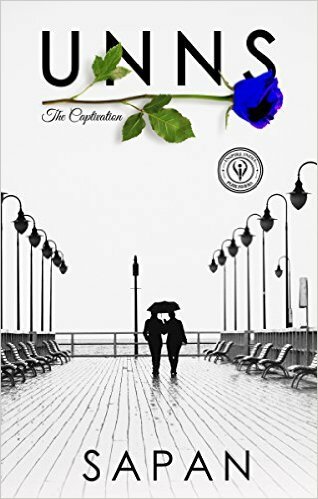 Review- UNNS: The Captivation is a love story blended with suspense and thriller to bind the readers with the book. Author has done amazing job with narration and characterization. Though certain loopholes, the book is still an enjoyable read. I received free review copy of this book from Arudha in exchange for an honest and unbiased review. Book Cover and Title- Book Cover is eye pleasing and soothing and goes well with the content of the book. The blue rose gives us slight hint about the love story with dash of obstacles. Title is very interesting and catches attention of readers. It creates curiosity about the book. Blurb too is exciting. Language and Narration- Language used in the book is simple and easy to comprehend. As said earlier, Narration is done very well and binds readers with the book. Narration is done in third person narrative. Characterization- Atharva Rathod and Meher Qasim are two protagonists of our story. Atharva is mature and loves Meher very much. Even though Meher breaks up with him, he's still in love with her. Meher is immature and bold. She is complex character and that's why readers are attracted towards her. Other characters are also justified well. Storyline and Plot- Story starts as a typical high school romance where Atharva and Meher meet and their love blossoms only to be separated from each other one day. First part of story is slow and boring and has nothing to give readers. It is predictable however adds essence to story. In second part, We see Atharva as a RAW Officer and he's in Germany for his secret misson where he meets Meher. To know further about their story, buy this book. Second part of the story is fast paced and for me story started from second part only. It is interesting with certain twists and turns and a major suspense which holds back readers with the book. Author has done fine job placing story. However climax could have been better explained. Overall, UNNS: The Captivation serves us one of the realistic, romantic thriller book which serves us unique plot idea and can be enjoyed by romance genre readers.